The third and final episode of Minecraft Story Mode’s post season bonuses launches next week. Why not check out our list of the best Minecraft seeds, since you’re here. This last episode from the Adventure Pass run is called ‘A Journey’s End?’, with that tantalising question mark posing the question: is it actually the end? Probably not, no. Season 2, anyone? The Adventure Pass is available for $14.99, and comes with three episodes set after the events of the first five, but that tell their own story. You following? You also need to own the first episode of the main story to play them, but you can purchase them separately for $4.99. There are a few new cast members along for the ride in Episode 8, including Jim Cummings (Winnie the Pooh, Darkwing Duck) as Hadrian, the leader of the Old Builders; and Kari Wahlgren (Rick and Morty, The Fairly OddParents) as Mevia, the Enforcer. 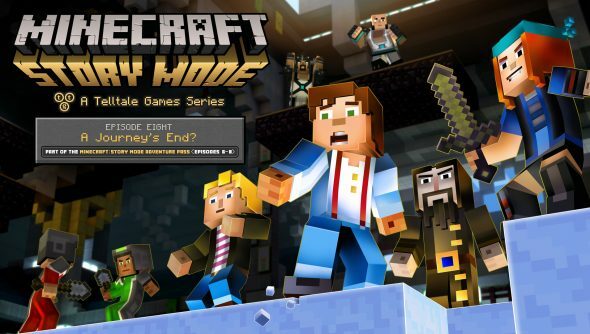 Minecraft: Story Mode – Episode 8: ‘A Journey’s End?’ releases on September 13.